Kurdish activists claim Turkey is building up its military forces in northern Syria for an assault on the Kurdish held district of Afrin, a development that could cause serious setbacks in the ongoing American-backed operation to liberate the defacto capital of ISIS, Raqqa. U.S. officials in Baghdad say they are aware of the troop movements by Turkish forces in the region, but would not elaborate further on their intent or purpose. "We have seen some movement," said Col. Ryan Dillion, a spokesperson for Operation Inherent Resolve. Turkey sending military equipment & weapons to Syria to launch a military attack against Tell Rifaat and Afrin. Turkey has long held that U.S. partnered Kurdish forces, the People’s Protection Unit, or YPG, is a terrorist organization with deep ties to the Kurdistan Workers Party, or PKK — an internationally designated terrorist group that has carried out attacks inside Turkey for decades. Relations between Turkey and the U.S. have soured since President Trump announced in early May the U.S. would arm Kurdish militants with the Syrian Democratic Forces — a coalition of Kurdish and Arab fighters. Back in April, Turkish warplanes bombed Kurdish positions in northern Syria and Sinjar, Iraq, killing several Iraqi Peshmerga and YPG fighters. Kurdish militants, demanding protectionfrom their U.S. allies, threatened to pull out of plans to liberate Raqqa from ISIS. To maintain a tenuous peace in northern Syria, U.S. Army Rangers in Stryker vehicles have been conducting "deterrence" patrols along the restless border area reporting on border violations and cross border skirmishes between U.S. Kurdish partners and Turkey. However, skirmishes between the YPG and Turkey and its proxy force the Free Syrian Army (FSA) have gone unabated. On June 11, Turkish-backed FSA forces mortared Kurdish forces near the city of Manbij, where U.S. forces are operating on a deterrence mission to keep the numerous warring parties in Syria focused on ISIS. Those mortar strikes landed near U.S. positions, according to Kurdish activists in the region. Officials in Baghdad confirmed the reports of indirect fire in Manbij to Military Times. "We are aware of reports of indirect fire in the area," said an official at U.S. Central Command. Shervan Derwish, the commander of the Manbij Military Council, described the attacks by the Turkish proxy force as an attempt to delay operations in Raqqa. These skirmishes in the region are common, according to Aaron Stein, a research fellow at the Atlantic Council. "Ankara has habit of pounding sand in northern Syria to prop up their allies’ against the SDF." Officials in Baghdad confirmed the reports of fighting between U.S. Kurdish partners and Turkish proxy forces to Military Times. 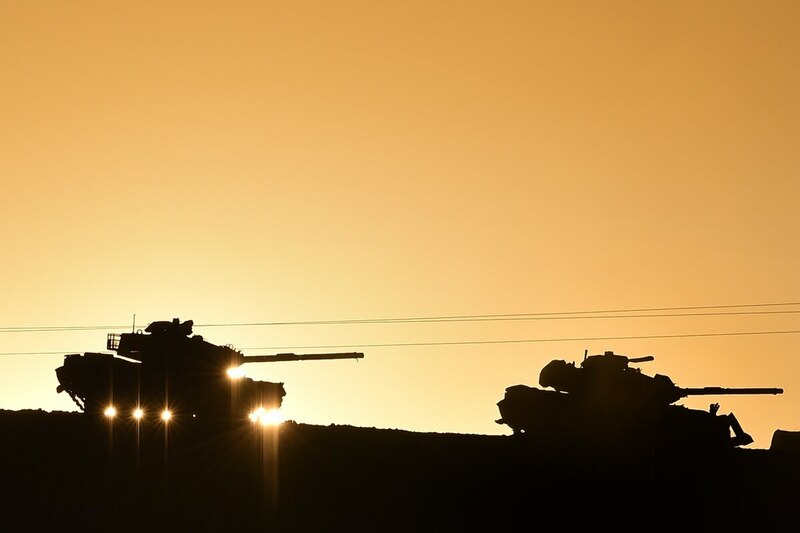 "The Coalition is aware of any current skirmishes between Turkish-supported forces and the SDF in Northern Syria," a spokesperson for the coalition told Military Times. However, not everyone is convinced the Turkish military movements are related to a pending assault on Afrin. Sometimes people following the conflict "mistake regular troop rotations for reinforcements, fueling a never-ending cycle of speculation about an expansion of the conflict," Stein said. "Turkey, I believe, is more serious about trying to work out a broader effort with Russia via the Astana process to insert some semblance of a peace keeping force into Idlib," Stein added. A Turkish-backed assault on Tel Rifaat, a northern Aleppo Governorate occupied by the YPG since last February, is a more likely scenario. However, Kurdish activists believe an assault on Afrin is pending, which could up-end U.S. plans to liberate Raqqa, and its fight against ISIS. Started just a few days ago by Kurdish activists, the twitter campaign #SaveAfrin has propped up, shedding light on what Kurds believe is a dire situation. Kurdish fighters, bolstered by U.S. air power, have entered their third week to liberate the ISIS capital. However, gains in the city have bogged down as the Kurdish militants have encountered fierce resistance and denser urban terrain. But, the SDF continue to take "one neighborhood at a time," Dillon said. An attack by Turkey against the Kurds in northern Syria could throw a wrench in the operation.